The Intensive scent and flavor of the Peppermint is well-known all over the world. Only the finest leaves are used for consumption. 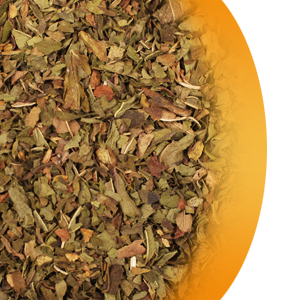 The typical taste derives from high contents of ethereal oils, which consist of 60% menthol. It is also popular for its various calming and relaxing effects. We recommend taking 1 level teaspoon per cup or 6oz. freshly boiled water and a covered steeping time of 10 minutes.